We’ve all been there. You aim your iPhone camera at a must-have photo and get an error message: Your storage is shot and the device will not hold another image. That’s the point when you frantically start deleting photos from the camera roll — hell, you’re even looking for entire apps to trash — in order to free up space. Too late. You missed your shot, chump. IceCream aims to never let you get into that sort of trouble again. 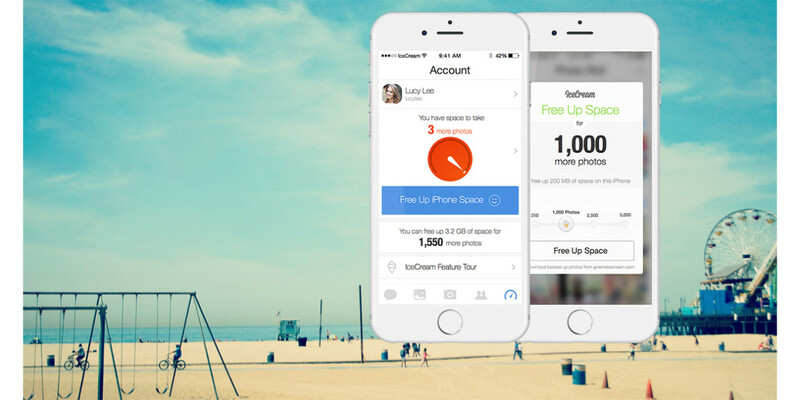 With a single button tap, you can instantly free up space on your phone. The app lets you select how much space you need — you can accommodate anywhere from another 250 to 5,000 photos. The app’s own space-saving camera lets you take up to 10 times the number of images you would with the native camera, with the same amount of storage. Not exactly from the forward thinkers? No worries. The app’s “intelligent notifications” come into play as you approach capacity, so you can free up space before you get stuck. By what magic does this happen? It’s called offline optimized photo storage. The app stores an optimized image on your phone, while the full resolution picture resides in the app’s cloud. IceCream also provides swipe-based management and two-tap sharing within a private network. IceCream is optimized for iOS 9 with app thinning to take up less space on the device and enables image search and deep linking to images. Its founder, George Berkowski, gives the complete lowdown on Medium about how this app came to be.